For many couples, traditional engagement ring designs are predictable and cliché, and they prefer more unique flower engagement rings. The variety of this figural design and its tremendous versatility make it perfect for many preferences, with the added benefit that it is often less expensive as well. Art Deco Engagement Rings: The stylized nature of flower rings and the interconnected use of metal and colored gemstones is perfect for art deco styles. The easiest bloom to incorporate into flower engagement rings is the basic daisy: a central bud surrounded by evenly spaced, symmetrical petals. This simple design has many variations using different colors and size of semi-precious gemstones, but there are other flowers that can be used as well. A stylized poinsettia is easy to create with short, pointed petals, or a tulip can be fashioned into holding a single radiant gem. Antique engagement rings often feature stunning roses molded directly out of the ring's metal, with a small but beautiful gem nestled in the center. Tiffany settings (prongs) are the most popular setting for floral rings, though they are not the only option. A bezel setting can highlight a gemstone and provide a smooth, uniform surface for "petals" to be attached, while a channel setting is suitable for any number of accent "leaves." Together, the daisy design of flower engagement rings is a cluster setting - the gems are clustered together to create the focal point. Couples who want a solitaire engagement ring often use different metals to accent the floral design rather than overload the ring with multiple petals and leaves. Rose gold is popular to add beauty and color to the ring, and its subtle pink hue is suitable for petals and other highlights. White gold is the most popular metal choice because it will not clash with colored gems, though yellow gold can add beauty and richness to many types of flowers. There are hundreds of different gemstones in the world, any of which could make a gorgeous flower engagement ring. Before choosing a specific gem, however, couples should consider the overall appearance of the ring and its cost. 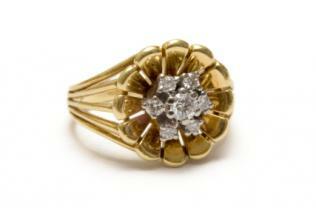 The most popular shape for floral rings is round: a round center stone surrounded by round petal stones. That is not the only option, however. Oval centers or petals add more uniqueness to the design, and some rings even feature trilliant shapes for leaves. 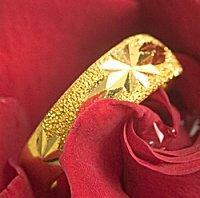 Marquise shapes, with their extra length and pointed tips, are also popular choices. 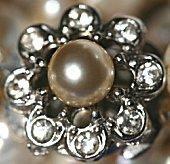 Pearl and diamond daisy design. Pink: Pink diamonds, sapphires, rubies, topaz, and tourmaline offer various light and dark shades of pink for flowers. Red: Garnets, rubies, topaz, and coral all feature stunning shades of red. Yellow: Citrine, topaz, yellow diamonds, amber, and sapphires are popular options for yellow hues. White: A white flower center is popular if choosing colored petals; diamonds, pearls, and moonstone are all gorgeous options with a hint of traditionalism. Green: Peridot, jade, malachite, or emerald gems are perfect for rich green leaves. Diamonds are the most expensive gemstone options, particularly fancy colored diamonds. Choosing synthetic diamonds or colored gems is a more affordable route, particularly since the ring will likely incorporate multiple gems. Gemstone carat size also plays a significant part in the ring's appearance and cost. Using a floral design maximizes the appearance of gemstones because the focus is on the entire ring rather than a single stone, allowing couples to opt for smaller, less expensive gems. The total carat weight of the ring may be greater than for a less elaborate design, however, which may increase the price substantially.Overall ring size is also important. Most floral designs are quite large once a center stone, petals, and a leaf or two is incorporated. This may not be the best choice for a bride-to-be with slender, small fingers - the ring will seem far too large for her and it will be more awkward to wear. The beauty and uniqueness of floral rings attracts many couples to their unusual designs, and the versatility of the rings allows them to be easily adapted for different couples' preferences. Birthstones may be used to add layers of symbolism to the piece, while the exotic design is also suitable as a right hand ring after the wedding. The cost is generally lower than traditional diamond rings with larger, higher quality stones, and ultimately, the meaning of the ring may be far more substantial than a more predictable ring. Regardless of the design, size, or price, flower engagement rings are a fun, romantic symbol for couples about to embark on their happily ever after.